Sodium (Na) reacts with water (H2O) to produce a solution of sodium hydroxide (NaOH) and hydrogen gas (H2). A chemical equation represents what happens in terms of atoms in a chemical reaction. Step 1: To write a chemical equation we need to know the chemical formulae of the substances. Step 2: The next step is to balance the equation: write a large number before each compound so the number of atoms of each element on the left hand side (reactants) matches the number on the right (products). This large number is the amount of each compound or element. During this balancing stage the actual formulas for each compound must not be changed. Only the number of each compound changes. If asked for an equation, the chemical equation must be given. State symbols are used to show what physical state the reactants and products are in. A solid piece of sodium (Na) reacts with water (H2O) to produce a solution of sodium hydroxide (NaOH) and hydrogen gas (H2). Relative formula mass (Mr) is mass of a molecule or compound (on a scale compared to carbon-12). It is calculated by adding up the relative atomic masses (Ar) of all the atoms present in the formula. The relative formula mass (Mr) for water (H2O) is 18. In Chemistry, the mole is a measure of amount of substance (n). The abbreviation for mole is mol. The mass of 1 mole of a substance is the relative formula mass (Mr) of the substance in grams. The Mr of water is 18. Therefore the mass of 1 mol of water equals 18 g.
Example: When calcium carbonate (CaCO3) is heated calcium oxide is produced. You can use reacting mass calculations to calculate the mass of calcium oxide produced when heating 25 g of calcium carbonate. Step 2: Deduce the amount, in moles, of CaO produced from 0.25 mol of CaCO3. This step involves using the ratio of CaCO3 to CaO from the chemical equation. From the equation you can see that the ratio of CaCO3 to CaO is 1:1. Therefore if you have 0.25 mol of CaCO3 this will produced 0.25 mol of CaO. Step 3: Calculate the mass of 0.25 mol of CaO. A simple format for laying out this method can be used. Example: What mass of ammonia (NH3) is formed when 7 g of nitrogen (N2) is combined with hydrogen (H2). Yield is how much product you get from a chemical reaction. The theoretical yield is the amount of product that you would expect to get. This is calculated using reacting mass calculations. In most chemical reactions, however, you rarely achieved your theoretical yield. You might expect to achieve a theoretical yield of 56 g of CaO from 100 g of CaCO3. However, what if the actual yield is only 48 g of CaO. The formulae of metal oxides can be found experimentally by reacting a metal with oxygen and recording the mass changes. Example: When magnesium is burned in air, it reacts with oxygen (O2) to form magnesium oxide (MgO). When some substances crystallise from solution, water becomes chemically bound up with the salt. This is called water of crystallisation and the salt is said to be hydrated. For example, hydrated copper sulfate has the formula CuSO4.5H2O which formula indicates that for every CuSO4 in a crystal there are five water (H2O) molecules. When you heat a salt that contains water of crystallisation, the water is driven off leaving the anhydrous (without water) salt behind. If the hydrated copper sulfate (CuSO4.5H2O) are strongly heated in a crucible then they will break down and the water lost, leaving behind anhydrous copper sulfate (CuSO4). The method followed is similar to that for metal oxides, as shown above. The difference of mass before and after heating is the mass of the water lost. 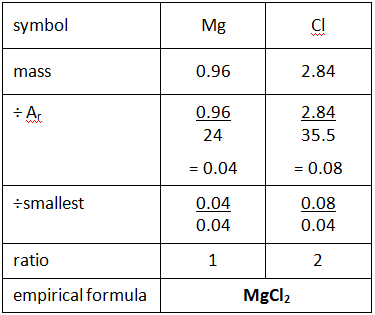 These mass numbers can be used to obtain the formula of the salt. The empirical formula shows the simplest whole-number ratio between atoms/ions in a compound. The molecular formula shows the actual number of atoms of each type of element in a molecule. Notice from the table that several different molecules can have the same empirical formula, which means that it is not possible to deduce the molecular formula from the empirical formula without some additional information. Also notice that sometimes it is not possible to simplify a molecular formula into simpler whole-number ratio, in which case the empirical formula is equal to the molecular formula. Example: What is the empirical formula of magnesium chloride if 0.96 g of magnesium combines with 2.84 g of chlorine? Step 1: Put the symbols for each element involved at the top of the page. Step 2: Underneath, write down the masses of each element combining. Step 3: Divide by their relative atomic mass (Ar). Step 4: Divide all the numbers by the smallest of these numbers to give a whole number ratio. Step 5: Use this to give the empirical formula. If you know the empirical formula and the relative formula mass you can work out the molecular formula of a compound. Example: A compound has the empirical formula CH2, and its relative formula mass is 56. Calculate the molecular formula. Step 1: Calculate the relative mass of the empirical formula. Step 2: Find out the number of times the relative mass of the empirical formula goes into the Mr of the compound. Step 3: This tells how many times bigger the molecule formula is compared to the empirical formula. 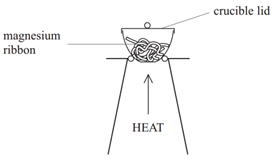 When you heat a salt that contains water of crystallisation, the water is driven off leaving the anhydrous (without water) salt behind. For example, barium chloride crystals contain water of crystallisation, and therefore would have the formula BaCl2.nH2O where the symbol ‘n’ indicates the number of molecules of water of crystallisation. This value can be calculated using the following method. Example: If you heated hydrated barium chloride (BaCl2.nH2O) in a crucible you might end up with the following results. 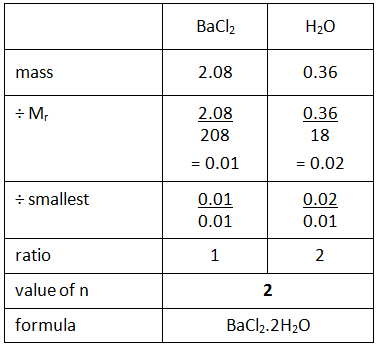 Step 1: Calculate the mass of the anhydrous barium chloride (BaCl2) and the water (H2O) driven off. Step 2: Use the empirical formula method to find the value of n in the formula. Concentration is a measurement of the amount of substance per unit volume. 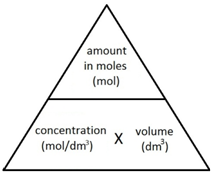 In Chemistry, concentration is measured in mol/dm3 (read as moles per cubic decimetre). The following formula allows for the interconversion between a concentration (in mol/dm3), the amount (in moles) of a substance in a solution, and the volume of the solution (in dm3). Example 1: 0.03 mol of sodium carbonate (Na2CO3) is dissolved in 300 cm3 of water. Calculate the concentration of the solution. Step 1: Convert the volume of water from cm3 into dm3. Step 2: Use the molar concentration formula to calculate of the concentration of the solution. Example 2: Calculate the amount, in moles, of 25cm3 of hydrochloric acid (HCl) with a concentration of 2 mol/dm3. Step 1: Convert the volume of HCl from cm3 into dm3. Step 2: Rearrange the molar concentration formula to calculate of the amount, in moles of HCl. The titration method that is used to prepare a soluble salt is also used to determine the concentration of an unknown solution. A pupil carried out a titration to find the concentration of a solution of hydrochloric acid (HCl). She found that 25.0 cm3 of 0.100 mol/dm3 sodium hydroxide solution (NaOH) required 23.50 cm3 of dilute hydrochloric acid for neutralisation. Calculate the concentration, in mol/dm3 of the acid. It can be useful, as shown above, to write the values of the volumes & concentration underneath the equation. Step 1: Calculate the amount, in moles, of the solution that you know the values for both volume and concentration. In this case sodium hydroxide (NaOH). First convert the volume of NaOH from cm3 into dm3. Then rearrange the molar concentration formula to calculate of the amount, in moles of NaOH. Step 2: Deduce the amount, in moles of the solution with the unknown concentration. In this case hydrochloric acid (HCl). Therefore if you have 0.0025 mol of NaOH, this will react with 0.0025 mol of HCl. Step 3: Calculate the concentration of the hydrochloric acid (HCl). Convert the volume of HCl from cm3 into dm3. Use the molar concentration formula to calculate of the concentration of the HCl. 25.0 cm3 of sodium carbonate solution (Na2CO3) of unknown concentration was neutralised by 30.0 cm3 of 0.100 mol/dm3 nitric acid (HNO3). Calculate the concentration, in mol/dm3 of the sodium carbonate solution. Step 1: Calculate the amount, in moles, of nitric acid (HNO3). Step 2: Deduce the amount, in moles of sodium carbonate (Na2CO3). Step 3: Calculate the concentration of sodium carbonate (Na2CO3). Concentration can also be expressed in g/dm3 (grams per cubic decimetre). Therefore mol/dm3 can be converted into g/dm3. Step 1: calculate the relative formula mass (Mr) of sodium carbonate (Na2CO3). Step 2: Recall the formula giving the relationship between mass, amount and formula mass. The molar volume of a gas is the volume that one mole of any gas will occupy. 1 mole of gas, at room temperature and pressure (rtp), will always occupy 24 dm3 or 24,000 cm3. Calculate the amount, in moles, of 12 dm3 of carbon dioxide (CO2). Calculate the volume at rtp in cubic centimetres (cm3), of 3 mol of oxygen, (O2). To determine the formula of a metal oxide by combustion. It is then possible to use this data to calculate the empirical formula of the metal oxide. By comparing the mass of copper produced with the mass of copper oxide used it is possible to determine the formula of the copper oxide. There is an important safety point to note with both versions of this experiment. 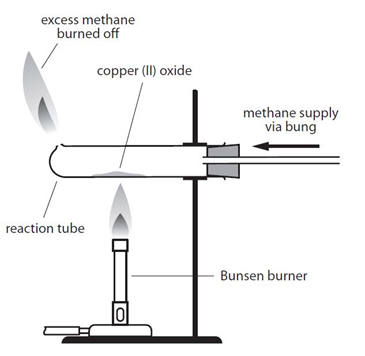 Both methane and hydrogen are explosive if ignited with oxygen. It is important that a good supply of the the gas is allowed to fill the tube before the gas it lit. This flushes out any oxygen from the tube, so the gas will only burn when it exits the tube and comes into contact with oxygen in the air.